It is a real delight to join you at tonight’s Reception. Let me begin by extending my warmest congratulations on the 100th anniversary of the Bank of East Asia! A hundred years ago, shortly after the end of the First World War, the Bank of East Asia was founded by several Chinese families in Hong Kong. In the past century, the Bank of East Asia took root in Hong Kong and provided modern financial services to local companies. It has also made vigorous efforts to explore markets on Chinese mainland and overseas. 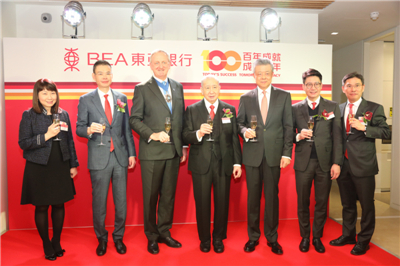 Through entrepreneurship, innovation and brand-building, the Bank of East Asia has grown to be a global financial services group based in Hong Kong. Looking back at a hundred years of pride and accomplishments, we have every reason to feel confident and expect greater achievements in the future. The world today is undergoing profound changes unseen in a century. China has entered a new era of development. Its relationship with the world has also experienced historic changes. 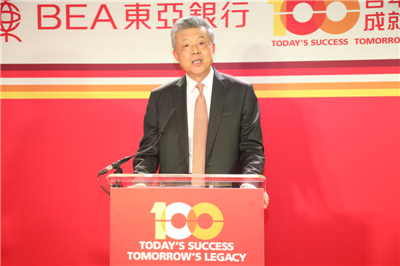 As we celebrate the 100th anniversary of the Bank of East Asia, I want to share with you my suggestions on how to seize the opportunities in the new era. First, follow the trend of reform and opening up. Reform and opening up hold the key to China’s future. China has implemented this policy for more than 40 years, and will continue to deepen reform and open its door wider to the world. In 2018, China showed the world its resolve to further open its market with concrete actions. The two-way opening up of the financial sector picked up speed. New measures covered foreign banks, insurance, securities and trust. At the just concluded “Two Sessions” of NPC and CPPCC, the Foreign Investment Law was adopted. This legislation will provide stronger legal safeguard for IPR protection and foreign investment in China. With a population of close to 1.4 billion, China will become a powerhouse for world economic growth. The new round of reform and opening up will bring more opportunities to Hong Kong-invested businesses, including the Bank of East Asia. My second suggestion is to get connected on the “big platform”. By “big platform” I mean the Belt and Road Initiative (BRI). Six years since it was proposed, BRI has become the world’s biggest cooperation platform and most popular public goods. This is best illustrated by the development of the Guangdong-Hong Kong-Macao Greater Bay Area, which has become a shining pearl of BRI. Later this month, China will host the second Belt and Road Forum for International Cooperation. We look forward to building up consensus with global partners on connectivity, high-quality development and new key cooperation projects. BRI is open, transparent, inclusive and beneficial for all. The UK, as a “natural partner” of China in advancing BRI cooperation, can work with China on broader, higher and deeper cooperation on BRI that are beneficial to both sides. I am sure BRI and the Guangdong-Hong Kong-Macao Greater Bay Area will provide a big platform for Hong Kong-based businesses, including the Bank of East China, to achieve greater development. My third suggestion is to explore China-UK cooperation with a broad vision. 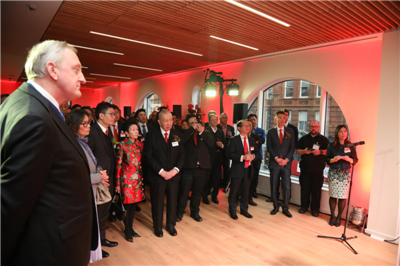 This year marks the 65th anniversary of the establishment of China-UK diplomatic relationship at the level of chargé d’affaires. As China-UK relations continue to deepen, financial cooperation between our two countries has become deeper, more diverse and more intensive. Hong Kong has close economic, trade and cultural connections with the UK. It has unique advantages in language, geographical location and legal system. Since establishing the first UK branch in London in 1990, the Bank of East Asia has provided all-round individual and corporate services, and achieved good results. This has met the needs of Chinese community here in Britain. It has also contributed to Hong Kong-UK relations and China-UK cooperation. Going forward, I hope the Bank of East Asia will continue to seize the opportunities created by the China-UK “Golden Era”. I hope you will tap your potential and leverage your comparative strength, so as to provide more financial products and services of higher quality. 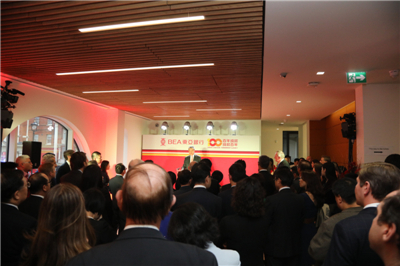 I am sure this will create new impetus and highlights for China-UK cooperation in financial services. I hope and believe that, in the next 100 years, the Bank of East Asia will turn more chances into good fortune, make more contribution to China-UK financial cooperation, and deliver more golden fruits to the China-UK “Golden Era”!